– If you don’t usually read YA, this is a book that MIGHT stand a chance of persuading you to try it more often. Watchers of Eden is a book that both reminds me why I’m not a big fan of ‘written to market’ fiction, yet at the same time reminds me that sometimes it does have its virtues after all. From an early stage I found myself making a game of spotting how the author had clearly mined The Hunger Games for recognised tropes and then applied them in a way that was almost perfect paint-by-numbers, exactly what market writers are becoming known for. Yet Watchers of Eden manages to avoid the label of ‘yet another rip-off book,’ and is a very well crafted page turner. Cyra Drayton, the protagonist, never enters an arena, and is in many ways a more likable protagonist than Katniss Evendeen. 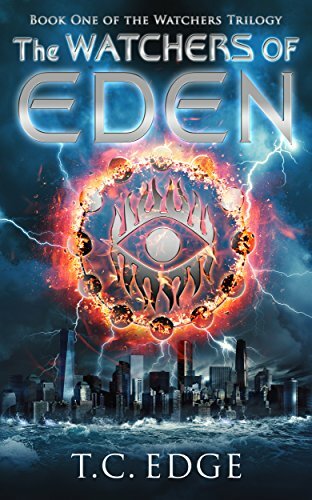 The titular ‘Eden’ is a far more interesting sci-fi setup than the capital of Pan-Em, and T C Edge an author more skilled at place description and atmosphere than Suzanne Collins – the variety of atmospheres and ways of life depicted in this book are what really make it a four star read. Augustus Knight is an equally insidious ruler when compared to Corialanus Snow. Then there’s Theo Graves, a character who in my opinion is the making this book, and this is where the HG comparisons stop, because he feels like the author’s own addition to the cast – a powerful reminder of every jerk the reader will have known as a teenager and at the same time, a great example of depth and character development that this reader hadn’t expected would be there. Theo’s changing relationship with Cyra is in many ways the most interesting curveball in the whole story. Although the Cyra-Theo-Jackson triangle seems very much like Katniss-Gale-Peter on the face of it, the only similarity is the setup, and even that is only reached with some serious character changes. By the end of the book I had a clear idea of who I thought Cyra should favour and I somehow doubt it was what was intended. Therein does lie a criticism though: the pace of this book is so fast that sometimes characters change too quickly. It’s well thought out, and believable, but the ‘overnight’ pacing of this highlights one of the problems of YA in general – longer pacing and longer books generally aren’t risked because of the target audience, but in the end this is fine, because the books biggest strength lies in it being a quick and easy read that has more to say than most novels designed to be read this quickly. Yes, some of the mysteries are predictable. Others are definitely not. It’s hard to do this without spoilers, but let’s just say that perhaps a reader who hasn’t been through Hunger Games yet would have more fun with the guessing games than I did. That said, I liked the first 2/3 of this book best because that’s where I was still guessing. The change that happens at around 60% moved into the kind of territory where there was less mystery and more battles to be won – the stuff that makes for a fun action film but a not so engaging book. Some of the solutions to the problems at this point become a little too convenient, although immense and far reaching power that comes with certain people being ‘watchers’ is kept about as well in-check as most authors can manage with what’s essentially a super-power and could easily become a fast solution to everything. Life isn’t quite that easy even for those who are heroes in this book, and that’s why for all its large scale grandstanding, I was with it until the end. And let’s be fair, it’s not just Hunger Games this book reminds me of; whether intended by the author or not this books is full of timely and appropriate lampshades. There’s a lovely nod to 1984 in the form of ‘what’s behind this door is your greatest fear’ (or ‘Room 101’) used in military training. The idea of one man killing millions to save billions is very Watchmen. New York having become Atlantis is a nice touch, and a pleasure city where people ‘are able to let off steam and enjoy themselves’ is something Hunger Games definitely does not have. A car chase where the car shoots between two train carriages is Lethal Weapon in prose form. There are one or two references and lines that made me stop to think about this futuristic world as well. Would the son of a council member really ‘get to see everything?’ The more I discovered about Theo, the more I began to think that really he’d only had the illusion of complete transparency given to him by his parents. Would the concept of ‘the good Samaritan’ still be called that in a world that’s so far lacked any biblical reference of any kind? (And indeed, religion would seem misplaced in a world where the main ruler seems to want to build the entire values and beliefs setup around himself.) Yet perhaps Cyra using the term reveals that certain things do slip through a net and certain expressions are timeless for reasons even the character herself doesn’t understand. ‘Everyone needs to have a use. If they don’t, they’re considered expendable.’ is also a beautiful one-liner that makes the cynic in me say that society really hasn’t changed much. In general Watchers of Eden is a fun book to read, and perhaps not supposed to be taken this seriously by an adult reader. It has a range of influences and detail that I imagine may well have been taken out of books like Hunger Games by development editors, and is much better off for keeping them, and a good example of why self-published YA is possibly more engaging than overly polished trad-pub. I would recommend anyone interested both this book and Hunger Games give this a try first. Next Next post: It’s launch day for Fighter’s Mark!